Cambridge is in the Boston metropolitan area, situated directly north of the city ofBoston proper, across the Charles River. It was named in honor of the University of Cambridge in England, an important center of the Puritan theology embraced by the town's founders. :18 Cambridge is home to two of the world's most prominent universities, Harvard University and the Massachusetts Institute of Technology. The city's population is around 105,162 making it the fifth most populous city in the state, behind Boston, Worcester, Springfield, and Lowell. Cambridge has been called the "City of Squares" by some, as most of its commercial districts are major street intersections known as squares. Kendall Square, formed by the junction of Broadway, Main Street, and Third Street, is also known as Technology Square, a name shared with an office and laboratory building cluster in the neighborhood caused by a flourishing biotech industry that has grown up around this area. 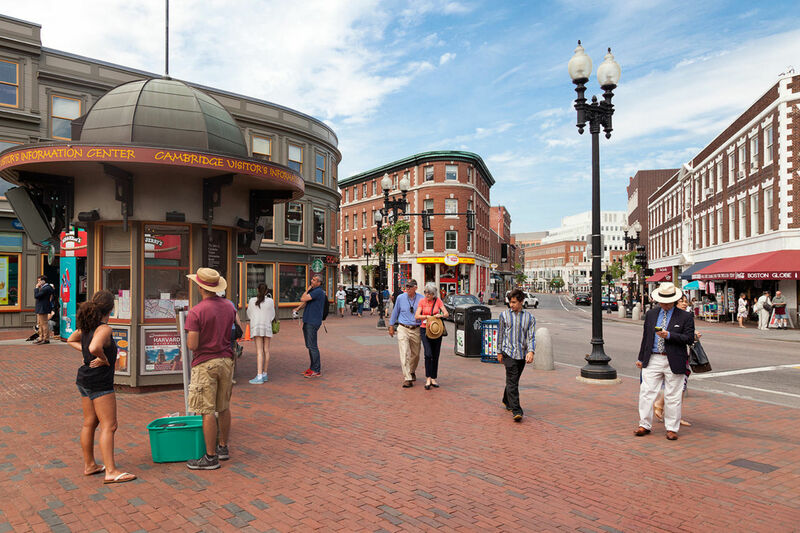 Central Square, formed by the junction of Massachusetts Avenue, Prospect Street, and Western Avenue, is well known for its wide variety of ethnic restaurants. Harvard Square, formed by the junction of Massachusetts Avenue, Brattle Street, and JFK Street. This is the primary site of Harvard University, and is a major Cambridge shopping area. Porter Square, about a mile north on Massachusetts Avenue from Harvard Square, is formed by the junction of Massachusetts and Somerville Avenues, and includes part of the city of Somerville. Lesley University's University Hall and Porter campus are located at Porter Square. Inman Square, at the junction of Cambridge and Hampshire streets in Mid-Cambridge. Inman Square is home to many diverse restaurants, bars, music venues and boutiques. A new community park was installed and is a favorite place to enjoy some takeout food from the nearby restaurants and ice cream parlor. Lechmere Square, at the junction of Cambridge and First streets, adjacent to the CambridgeSide Galleria shopping mall. Perhaps best known as the northern terminus of the MBTA Green Line subway, at Lechmere Station.